The Columbia River 2839 Black Fork Hunting Knife Set contains three fixed blade knives that give you everything you need to field dress game. It includes a broad-bladed, drop point skinning knife, a slimmer caping knife for trophy taking, and a sturdy European-style gut hook. All three are made entirely from stainless steel, making them strong and easy to clean. The skeletonized handles provide a secure grip while reducing overall weight, and they feature large lanyard holes that allow you to lash them to your wrist for retention. 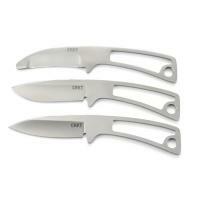 The knives come with a durable roll-up sheath for portability and protection.